What happened in residential schools was not “cultural genocide”. It wasn’t “language genocide”. And it wasn’t “almost genocide”. What happened in residential schools was genocide. Canadian officials targeted Indians for assimilation and elimination purely for economic and political reasons. Scalping bounties on certain Indigenous Nations are indicative of such a lethal mentality. Canada wasn’t killing Indians because of our cultures; it was killing Indians to get rid of the “Indian problem” as Indian Affairs officials kept referring to it. Commentators often refer to Duncan Campbell Scott’s quote regarding Indian policy in Canada as proof that the intention was assimilation and not elimination. “I want to get rid of the Indian problem. […] Our objective is to continue until there is not a single Indian in Canada that has not been absorbed into the body politic and there is no Indian question and no Indian Department”. 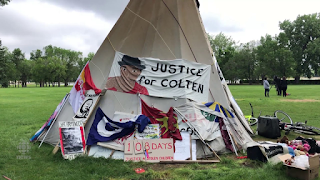 Yet, there was no shock and alarm at the time nor did anyone from Indian Affairs come up with an emergency action plan to protect Indigenous children whom Scott referred to as “inmates”. Surprisingly, the deaths of Indigenous children appeared to be in line with the objective of the policy. “Indian children… die at a much higher rate [in residential schools] than in their villages. But this alone does not justify a change in the policy of this Department, which is geared towards a final solution of our Indian problem”. Residential schools were never a well-intended policy “gone wrong” as claimed by former Minister of Indian Affairs, John Duncan. They were death camps for nearly half of all the “inmates” who entered some of those schools. The tiny hand-cuffs and the electric chairs speak of horrors completely unrelated to “education”. These children didn’t die from smallpox or some other series of unfortunate and unpreventable events in those schools. Many of these children were starved, tortured, beaten, raped, and murdered. Nutritional tests and medical experimentations were done on these children only to be denied to benefit of the very medicines created at the expense of their suffering. This sounds eerily familiar to horrors inflicted on other populations around the world. Survivor stories of frequent rapes, forced abortions, and unmarked graves stand in stark contradiction to any notion of a benign education policy – especially once government, church and law enforcement officials became aware of what was happening. Why else did these schools have graveyards instead of playgrounds? Much of the debate has focused on whether or not Canada “intended” to kill Indians. According to international legal experts, leaders can be held accountable if they knew or should have known about the actions and failed to prevent them. Direct evidence of intent is not necessary but can be inferred from circumstantial evidence. The few excerpts above prove that Canadian officials knew not only of the poor conditions in residential schools, but the large number of deaths that were occurring, and that they could be held accountable for “manslaughter”. Many have argued that the totality of Canada’s actions towards Indigenous peoples amounted to genocide. In other words, Canadian officials have been guilty of some or all of the above genocidal acts. We will never get to reconciliation unless we know the truth – all of it. So far, we have only scratched the surface. We are not over-represented in prisons, in child and family services and as murdered and missing Indigenous women and girls because of our cultures. We are targeted because we are Indians. Indigenous Nations stand in the way of unfettered land and water use, resource extraction and industrial development – i.e. complete environmental destruction in the name of corporate profit. In addition to the incredible emotional and psychological toll this must have taken on Justice Sinclair and his team, they stood strong in the face of the most aggressive anti-First Nation government Canada has been in years. They, together with the survivors, are true heroes. But we can’t expect the TRC to carry this burden alone. Nor is this story complete. The TRC went as far as it could to address the issue of genocide in the face of various legal considerations and consistent political denial that these schools were anything other than well-intended educational institutes. It’s on the rest of us to stand up for the truth and ensure Canadians know everything that happened in the schools covered in this report and the ones not yet exposed. Canada tried in various ways to eliminate our cultures – through residential schools and outlawing our ceremonies and practices in the Indian Act. This is all true. But Canada also created the conditions which led to our deaths by the thousands inside and outside residential schools. This is also true and this is genocide. Once we can put the truth in the table, then we can talk about reconciliation. We need to act on the TRC recommendations related to truth-seeking: a national inquiry on murdered and missing Indigenous women and girls, an investigation into the over-representation of Indigenous peoples in prison, and immediate action and reporting on the over-representation of Indigenous children in foster care. We must focus on getting all the facts so we can finally see justice for Indigenous peoples and true reconciliation. 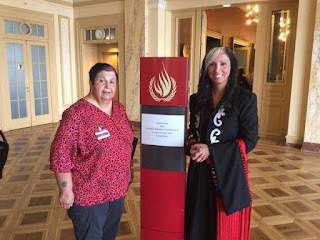 A determination that Canada did not commit genocide does not put an end to the story. It’s only just the beginning and it’s not going to be as easy as saying sorry. Canadian and Church officials who committed such horrific crimes upon Indigenous peoples need to be brought to justice. The mass murder or manslaughter of our people requires criminal prosecution – just like it would anywhere else in the world. Canada doesn't receive a "Get out of Jail free" card simply because it hid its atrocities so well. Real reconciliation requires justice. (1) Dr. Peter Bryce, "A Story of a National Crime: An Appeal for Justice to the Indians of Canada"
(3) The National Post, "Canada was ready to abandon 1948 accord if UN didn't remove 'cultural genocide' ban, records reveal"
A tremendous job Pam.Those early politicians were just clearing a path for the mess we have today for corporate control.Yes they should be held to account for these crimes and genocide is the appropriate term.I tried last Sunday to voice my opinion on cross country checkup but was put off continually when I told the person screening the calls that the root was the doctrine of discovery and the monarchy that led the way.Censorcism is alive and well in Canada. 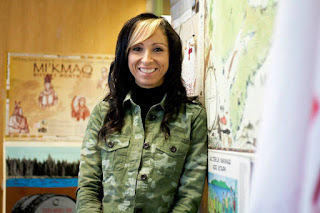 Very good Dr. Palmater. You clear things up.